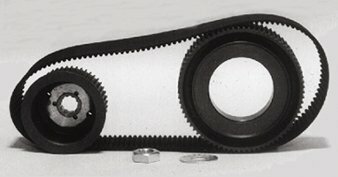 8mm Belt Drive Fits Big Twin 4 speed 1955/Early 1984 3'' Kickstart Model 47T-76T Pulley Combo-by-Belt Drives Ltd.
8mm Belt Drive Fits Big Twin 4 speed 1955/Early 1984 3" Kickstart Model 47T-76T Pulley Combo-by-Belt Drives Ltd. These belt drives have hard anodized aluminum pulleys which provide superior wear characteristics, as well as hardened clutch dogs and chrome-moly carbonized steel bearing surfaces. Belt drives transfer power over 10% more efficiently than chains and drastically reduce noise and vibration. 2 inch and 3 inch open kits include a solution clutch hub bearing kit. Note: Due to numerous variables of misalignment and improper tensioning upon installation, there is no warranty on belts. If you have any questions about this product by Belt Drives, contact us by completing and submitting the form below. If you are looking for a specif part number, please include it with your message.